Offer Terrific Quality, Value & Convenience - All In One! The wait is over! World-famous MODEL CRAFT TOOL sets are now available in North America from BILLING BOATS USA, Inc., exclusive distributor for SHESTO LTD.
1050/CM 50-Piece Knife & Tool Set w/FREE Cutting Mat. Ideal for all hobbyists and crafters, this handy set boasts a complete assortment of cutting implements - knives, mini chisel & blades, planer, scriber points, sharpening stone, and FREE cutting mat! It's the perfect mobile cutting station! 1012 12-Piece Boat Building Tool Set. Great for model boat builders and general crafters, this convenient collection sports mini-pliers, craft knife with 5 x #11 blades, sanding block, flat diamond file, hammer, bent nose tweezers, and swivel-top pin vice. 1012GP 12-Piece General Purpose Tool Set. This useful assortment contains a dozen of the most popular tools for general hobby & craft projects. Perfect for DIY and household repairs, too! 1013 13-Piece Model Rail Tool Set. Terrific for model railroad enthusiasts, this valuable set features a craft knife with blades, precision tweezers, razor saw, pliers, hobby hammer, swivel-top pin vice, and a Phillips-head screwdriver. 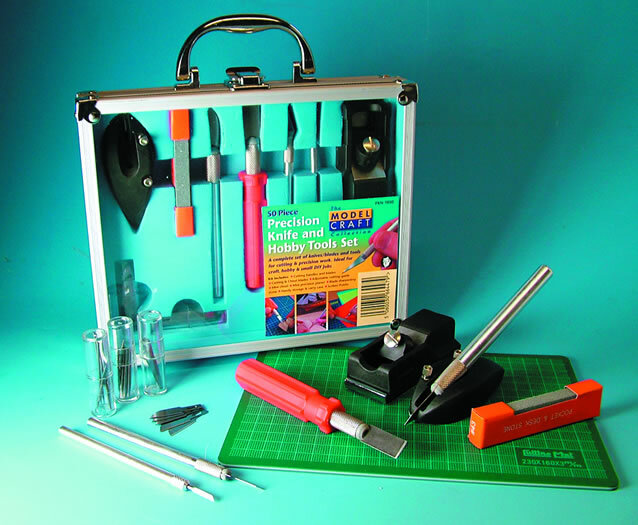 Each MODEL CRAFT TOOL set also includes a handy, attractive metal storage & carrying case. Suggested retail price (SRP) is just US$49.99* each. The growing MODEL CRAFT TOOLS range - available at finest craft and hobby retailers everywhere - features over 250 innovative implements for hobby, craft, DIY, woodworking, and household uses. In addition to MODEL CRAFT TOOLS, BILLING BOATS USA carries BILLING BOATS kits and accessories and WINDJAMMER model boats. Visit www.BillingBoatsUSA.com for product news, special offers, helpful links, hints and tips. Or contact BILLING BOATS USA, 13699 W Thannum Fire Lane, Hayward, WI 54843, USA. World renowned for matchless accuracy and quality since 1958, the BILLING BOATS line includes historically significant subjects from all ages. The growing MODEL CRAFT TOOLS range features over 250 versatile, innovative implements for hobby, craft, DIY, and household uses. And the exclusive WINDJAMMER range features nine highly detailed, authentic model boat replicas of famous subjects like the HMS Bounty, Mayflower and Cutty Sark. BILLING BOATS USA remains your one-stop source for the world's finest model boats, hobby & craft tools, fittings and accessories. The company offers dozens of products for model boat enthusiasts from beginner to expert - even for children!